Loots were a [Desecrated Waistguard] for Splug, a [Band of the Inevitable] for Alhazred, and another [Splinter of Atiesh] for Jigfrog. Nice work all. Loots were [Desecrated Handguards] for Delurs and Jehdin, and a [Crystal Webbed Robe] for Stingray. Nice work all. Loots were [The Widow's Embrace] (Shadowflame), and [Desecrated Wristguards] (Rhoko). 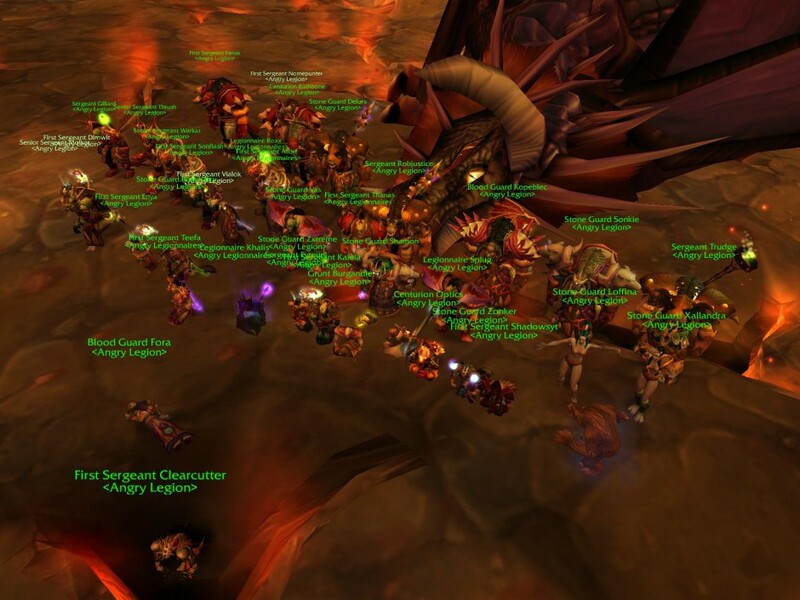 Grats to all on getting this one done. Loots were [Wristguards of Vengeance] (Supervas), [Desecrated Wristguards] (Delurs), and another [Splinter of Atiesh] for Jigfrog. 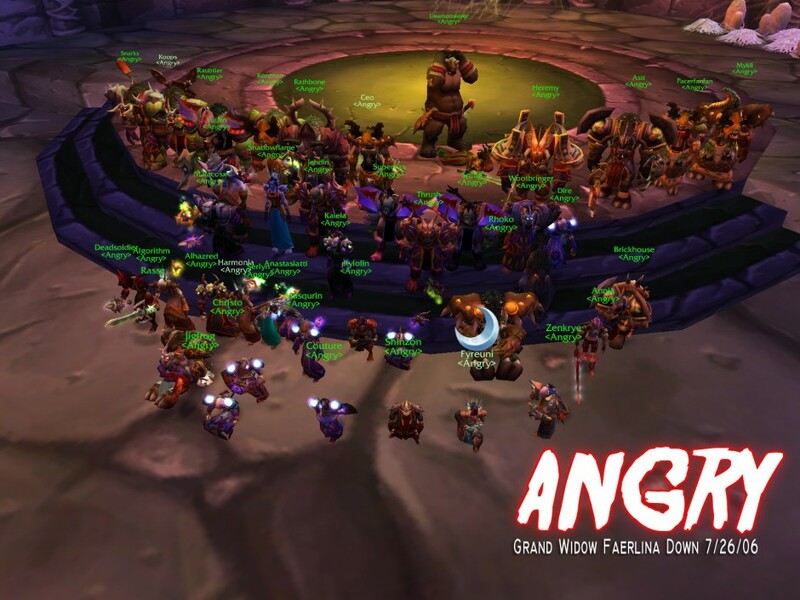 Big grats to the entire guild on a job well-done, and being among the first five guilds on Illidan to claim a Naxxramas kill. The loots were a [Veil of Eclipse] (Stingray), [Desecrated Boots] (Algos), and the beginning of the legendary staff quest: a [Splinter of Atiesh] that went to Jigfrog. Title says it all. 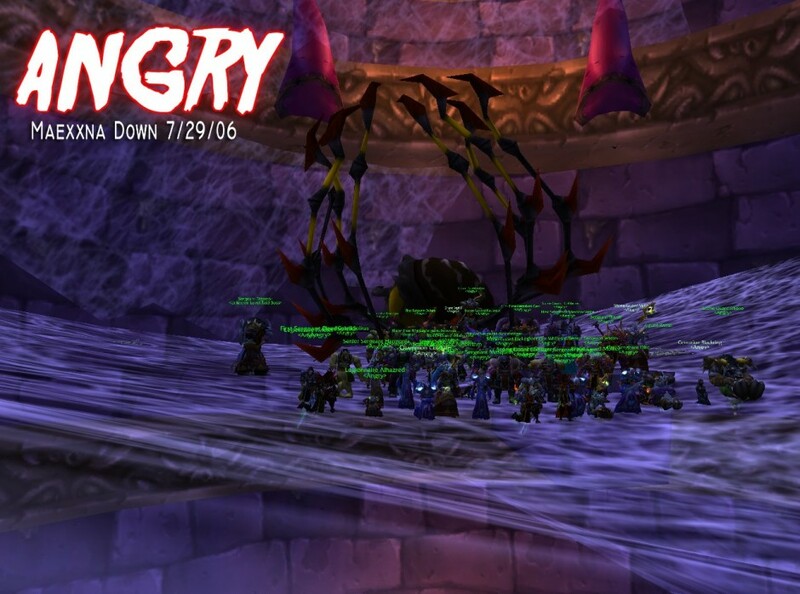 After tons of work and complications from horrible servers, the Twin Emperors finally went down in AQ40. Congratulations and thank you to everyone that helped along the way and everyone that came out for the fight! 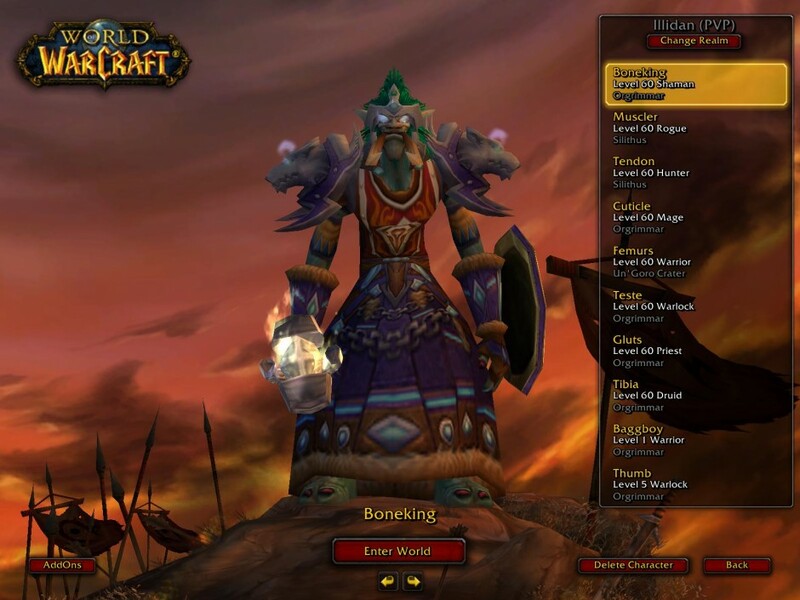 The King of Bone has expanded his rule into various other parts of the body (not to mention WoW classes), having finally completed his levelling of seven alts: Tibia (Druid), Tendon (Hunter), Cuticle (Mage), Gluts (Priest), Muscler (Rogue), Teste (Warlock), and Femurs (Warrior). Undoubtedly not a WoW first, no idea if it's a server first…but a crazy accomplishment just the same. 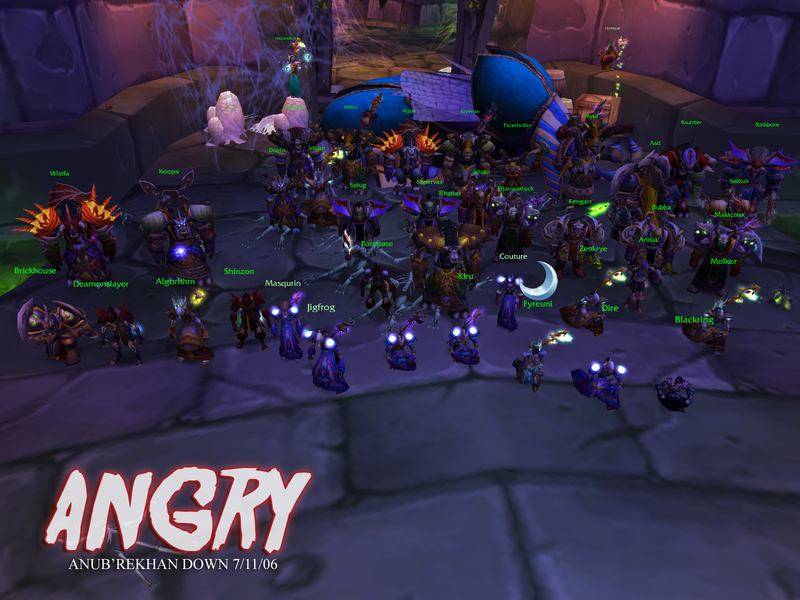 In order to properly celebrate April Fool's Day, Angry and Blood Legion decided to merge our guilds into the formidable Angry Legion. 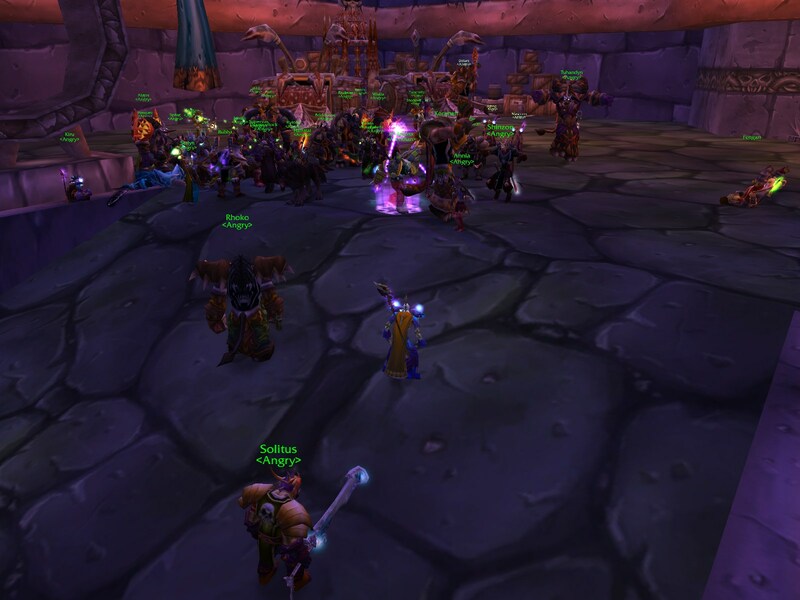 The newly-created guild broke up a mere 24 hours later, but not before achieving a couple server firsts! 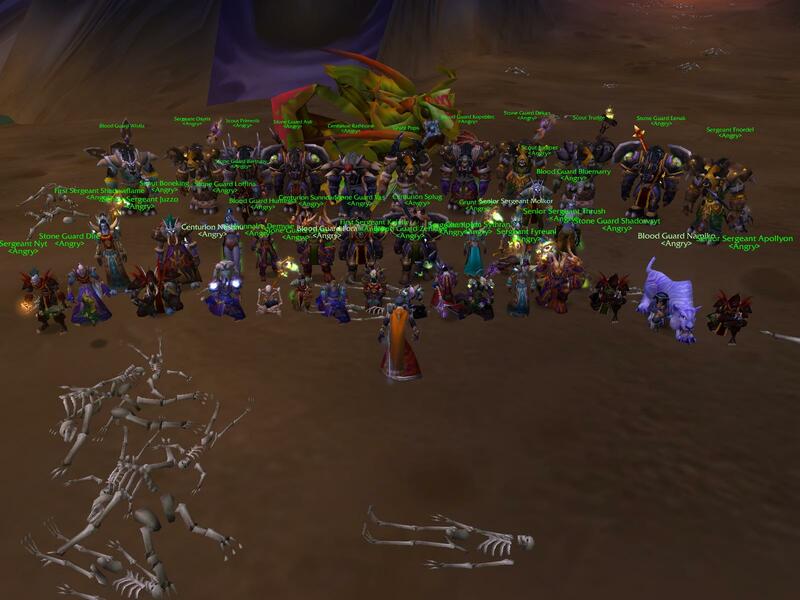 Most likely the quickest Onyxia kill for a new guild ever (less than one hour after the guild was formed), and first Illidan guild to field two 40-man raids (in BWL and AQ40) simultaneously! 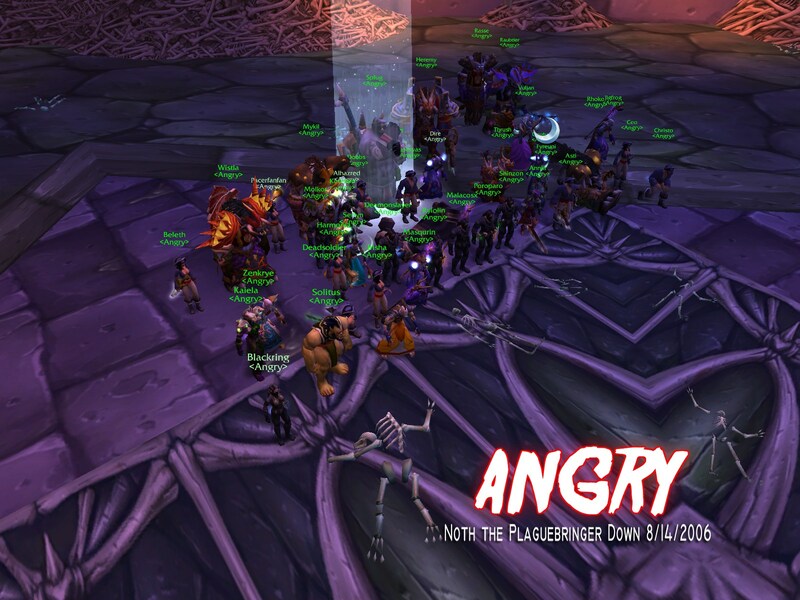 Grats Angry Legion, and RIP. 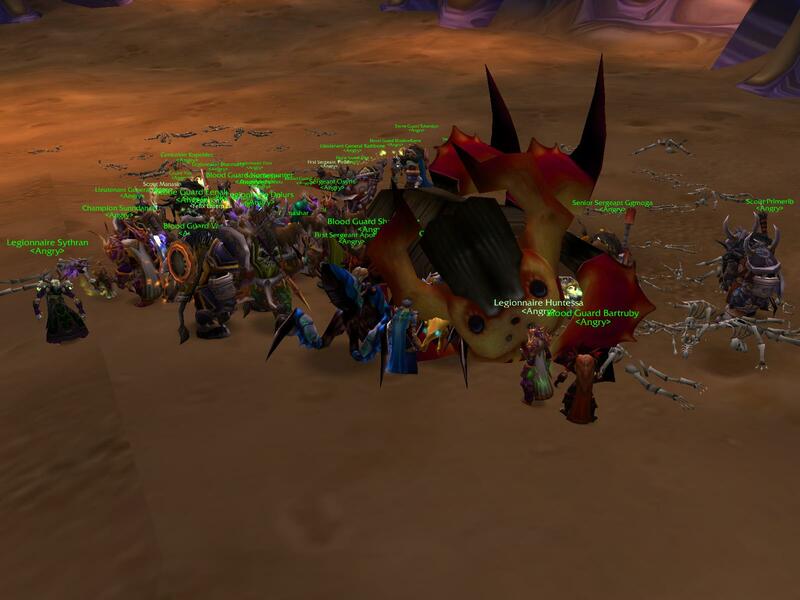 Grats to the loot recipients: [Cloak of the Golden Hive] to Primerib, [Qiraji Bindings of Command] to Vas, [Qiraji Bindings of Dominance] to Dire, and [Imperial Qiraji Armaments] to Shadowsyt. Next on the Angry agenda: the Twin Emperors.